You can give your Jaguar or Land Rover the care and attention it deserves without paying main dealer prices, and without compromising on standards of workmanship or service in any way. As an independent Jaguar and Land Rover specialist, Tom Lenthall Limited can support you with all the same services and technical expertise you’ll find at your main dealer – but at significantly reduced prices. Our team of factory-trained Jaguar and Land Rover master technicians have devoted their careers to working exclusively on these prestigious marques, acquiring an unrivalled level of experience, specialist knowledge and craftsmanship along the way. With our spacious 6,500 square foot workshop, state-of-the-art equipment, a full paint and body shop, and authorised online factory access, we’re able to offer servicing, diagnostic, and repair facilities to match any Jaguar or Land Rover main dealer. Since 2007, our reputation for outstanding workmanship backed up by friendly, personal customer service has earned us a loyal and growing base of Jaguar and Land Rover owners who entrust us to look after their vehicles. The driving force behind the team at Tom Lenthall Limited, Tom’s pedigree is as rich as the marques he works with. Having developed an early love of all things mechanical – repairing bikes and motorcycles from the age of 12, Tom went on to study mechanical engineering at college, before undertaking a four-year apprenticeship with classic Jaguar restoration specialists, RS Coachworks. By the time he was in his mid-twenties, he was already building concourse winning vehicles and preparing race cars for events. From working with classics, Tom moved to a Jaguar main dealership, becoming a master technician and winning the Jaguar masters finals, leaving after 12 years to set up his own business. 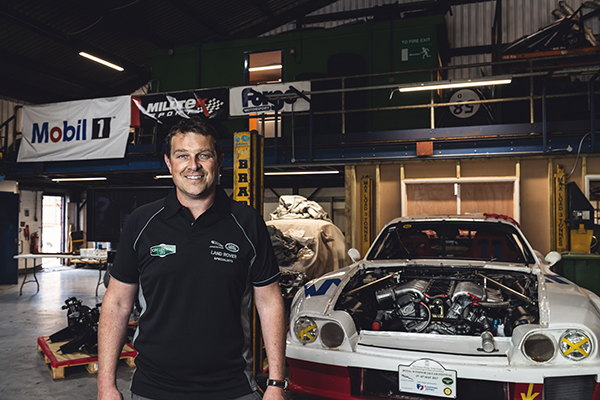 Tom is now primarily focused on project management, overseeing ongoing restorations, tuning and performance upgrades, and ensuring his own race cars, an XJS, and a1963 Mk 2 are at the top of their game. Having realised a lifelong dream and finally purchasing my dream car as a 97 XK8 convertible it would soon become apparent to me that my basic mechanical knowledge for the car would not be enough to keep her running smoothly so would take some expert TLC on occasion to keep her running as she should. On asking the local garages it was clear there was only one recommendation – Tom and his staff. My older lady has now seen Tom for a number of concerns ranging from complicated misfires to a full gearbox rebuild. On every occasion, Tom is able to identify the issue through knowledge, experience and diagnostic expertise and suggest corrective actions with advice and clear explanation to the cause and remedies, fixing issues there and then or for more complicated issues arrange quick and convenient times to assist. For the friendly atmosphere and expertise offered by Tom and his staff, I don’t believe I would or could trust my pride and joy with anyone else. I was introduced to Tom a few months after buying my 2001 XK8 by a fellow XK owner, as I wanted a real V8 sound instead of the standard exhaust. What became clear very quickly, was that apart from a very obvious passion for Jaguar’s his knowledge and experience was very in-depth and thorough. What sets Tom Lenthall Ltd apart for me is the time he takes to explain the “what, where and how” as well as the ability to be shown what has been done and is being done when you take the car in for anything from a service through to a complete gearbox or differential rebuild. If asked, the one thing I would say about Tom and Tom Lenthall Ltd is that he works on the cars as though they were his own, basing any decisions as though he would have to pay for the work to be done and therefore you don`t feel as though things are completed when perhaps they didn`t need doing! Its great to see the business going from strength to strength with many other Jaguar Specialists using Tom Lenthall Ltd for some of their more in-depth and complex work too, I will continue to use them for as long as I own a car!